Vintage news on the stateliest ship afloat. 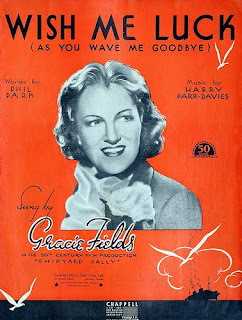 On this day in 1938, top English singer/actress Gracie Fields--"Our Gracie"--arrived at the height of her career in New York aboard the Queen Mary. The gal who was born over a chip shop had been the highest paid film star in the world the previous year. In 1939, she would star in the picture Shipyard Sally, in which she played a music hall performer in Clydebank, who with her father tries to help the unemployed shipyard workers by convincing the owner to resume building on the Clyde. The final scene shows the construction and launch of the Queen Elizabeth while Gracie sings Land of Hope and Glory. Karen D. Clark 2010. Powered by Blogger.